February premium ATM calls are trading at over 80% volatility so 1 FEB 65 CALL and 1 FEB 70 CALL were shorted into earnings to collect premium against the long MAR 65 CALL bought on 1/28/11. In the event that ROVI misses earnings and the stock drops below 65 until Friday expiration then premium of 2.15 is collected lowering the risk of the MAR 65 CALL from 4.80 to 2.65 (2.40 * 2 = 4.80; 4.80 – [1.40 + 0.75]). Lock in profit with potential for further gains. 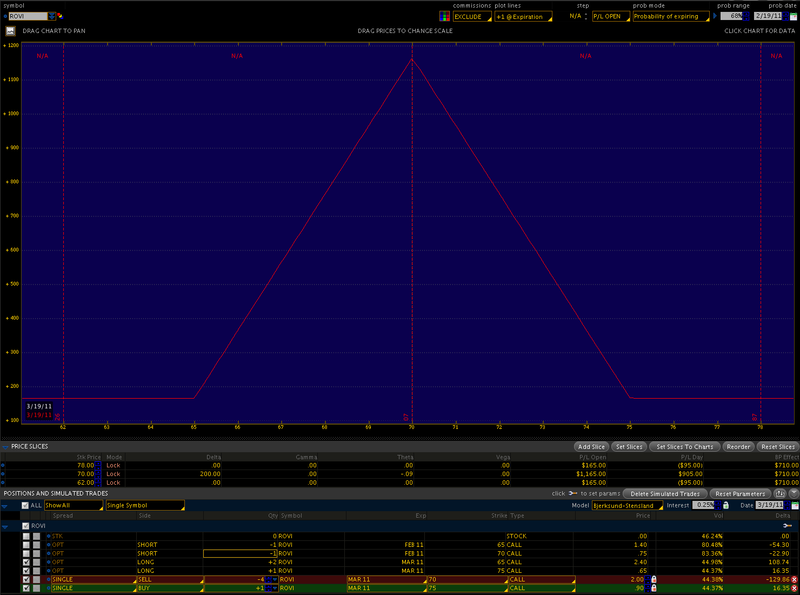 Convert April PG position to risk-less butterfly arbitrage. Profit from APR 67.5 CALLS not included in credit. Since the zero-profit position comes from the sale of 1 APR 65 CALL @ 1.17 then anything above that locks in profit at $1/cent above 1.17. 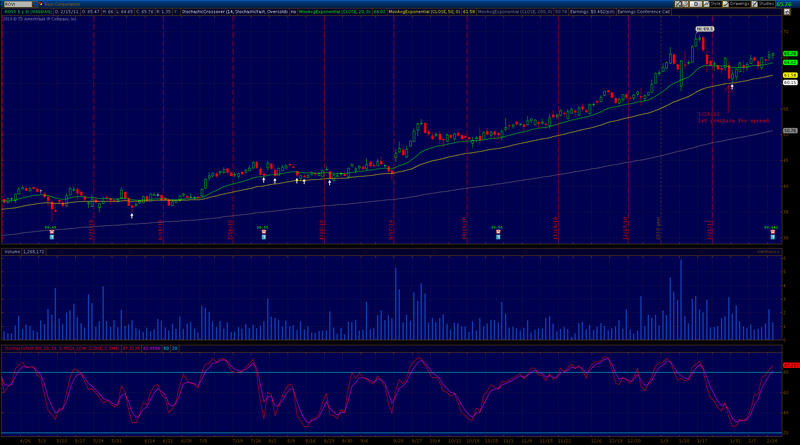 The maximum profit at expiration is $250 if the underlying closes at 65 on 4/15/11 and the 65 CALL is sold at 1.17. Profit will be higher from the sale of the 4 APR 67.5 CALLS currently held but this is not included in the calculation for the arb. Since the spread has been “legged” into starting from the long side, the higher the underlying goes before the CALL is sold the higher the profit is that gets locked in. 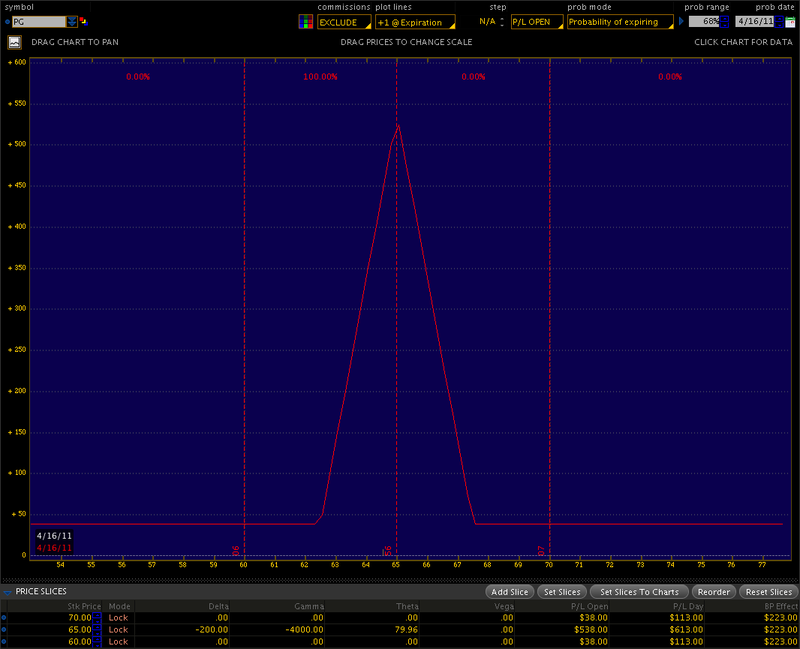 NOTE: The simulation uses the closing market value for the short APR 65 CALL. This position has no risk of loss to expiration. 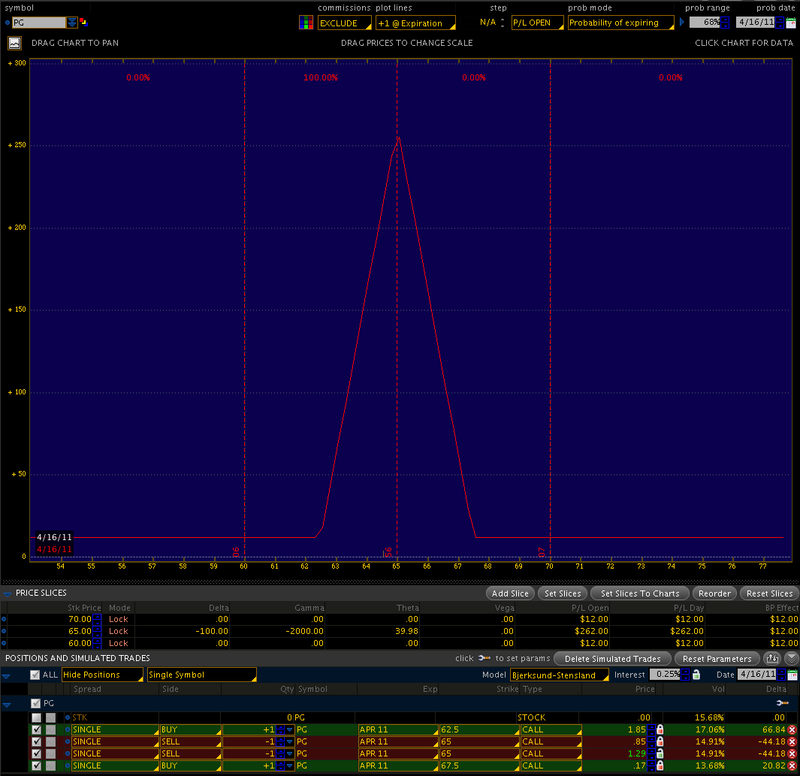 Maximize profit in butterfly arb using unrealized profit in APR 67.5 CALLS and APR 62.5 CALLS. 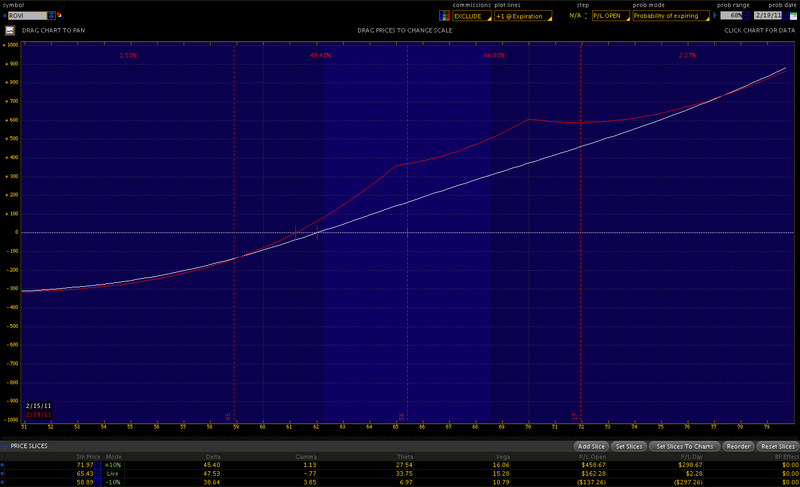 Maximum profit potential is $538 on 2/4/2 vs $262 on 1/2/1 butterfly if underlying closes at 65 on 4/15/11.